How is everyone?? I am so tired, I only got 5 hours of sleep last night! I apologize to all of you for whom that is a regular occurrence but I need my 8 hours! If you've been reading this blog for awhile you know I usually get that, plus some on the weekend! LOL. Maybe the gods will have mercy on me and I can take a nap later! Anyways, we don't have much of a weekend planned over here; yesterday I had to work and then last night I went to Juniper for dinner with a friend that was in town. She slept over at our place and we stayed up late talking (hence the lack of sleep last night!). Today I just need to get a few things done (blog post, laundry, nails, breakfast/lunch meal prep) but other than that we have no plans. Probably just a lot of couch time, LOL! I also purchased this top in the blue stripe (I wasn't able to add it to the widget above! Argh!) . It doesn't look like much on the model but I saw it in store and it's super soft and I think will look great half-tucked with high-waisted skinny jeans and denim shorts in the summer. I finally got my hair cut and coloured last week and it feels so much better! 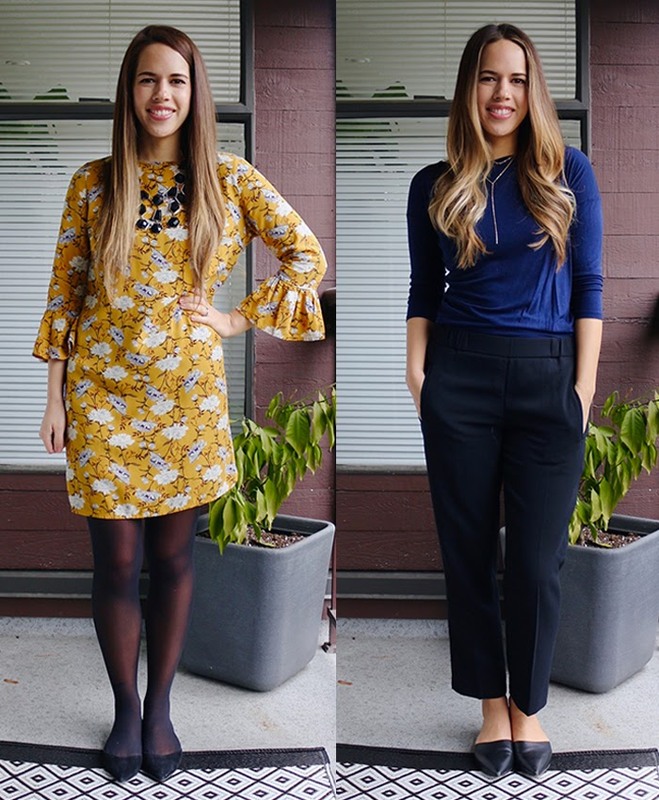 The last outfit from this week with the navy top is from the day after I got it done; I literally did nothing except dry shampoo and finger brushing that morning! Oh, and speaking of hair, on Monday (the striped dress outfit), my curling iron stopped working when I was literally halfway through curling my hair! I had to brush out the curls and then do a side sweep so it wouldn't be so obvious! LOL I actually re-ordered the exact same curling iron off Amazon that morning for same-day delivery but we were out when they tried to deliver it so I didn't get it for a few days! In other sad news, I lost a diamond from my wedding band!! I have to take it in to get fixed and am scared of how much it's going to cost! I don't want to lose any more either so I took it off yesterday and now my ring finger looks so bare with just my engagement ring on! It's funny the things you get used to! Anyways, thank you all for visiting and I hope you have a great week!! I used to be one of those people who needed 8 hours (and I still probably do) and then I had kids! Haha! I can't wait until our youngest starts sleeping through the night and I can get back to that! It makes such a difference in my mood and energy level! That pleated red midi skirt you ordered...LOVE! I have one and it's really fun for dressing at the holidays like July 4th or Valentine's Day. And I really like the Gap mules you ordered! 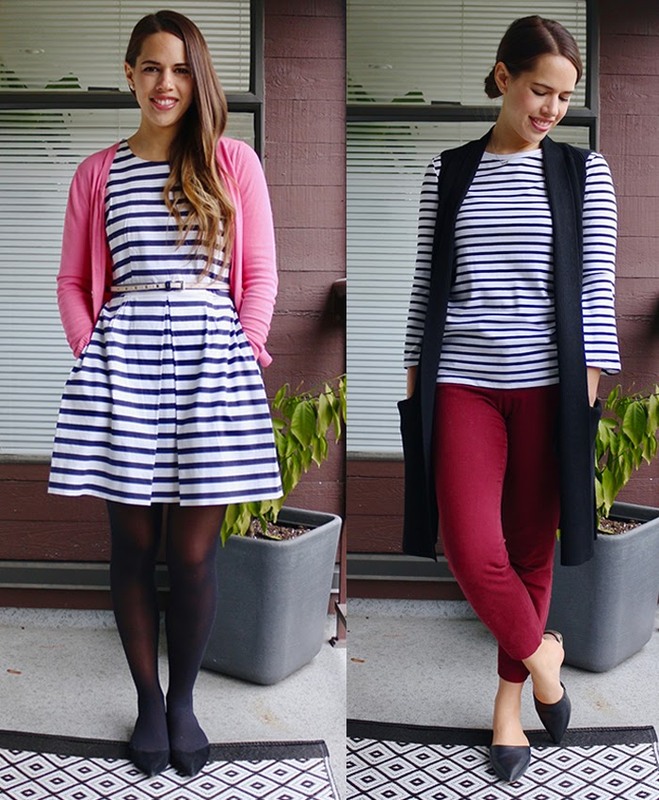 I love the navy and white striped dress, it's lovely! Glad you had fun spending time with your friend!